Home / News / Events / Deciding on the right veil for your big day! Deciding on the right veil for your big day! Accessories tend to be one of the last things brides-to-be think about. However, there are those brides that know exactly what they want the moment they said yes to the proposal. Sometimes, even earlier. There’s absolutely nothing wrong with that but there’s a possibility of disappointment when the veil you thought you wanted doesn’t fit your frame or your dress. However, don’t be discouraged by this. It’s better you know your options before you accessorize. One of the trickiest things to decide about your veil is the length of it. Where do you want it to fall? Do you want a blusher with it? Or would you prefer a short birdcage style? These are very important questions. But how do you figure it out? Here’s a diagram explaining the lengths and options you have. When picking the length of the veil, you always want to keep your dress in mind. Is the length going to cover up your details or is it going to add to your look? Is it going to affect how you walk down the isle or the hairstyle you want? Your hair accessories should always compliment your look, not take away from it. The best way to be sure what veil works for you is to try them on. There’s no shame in trying multiple lengths and styles. It’s better you do that now then regret it on the day of. Another great idea is to have all your accessories by your first fitting. That way if you have to make any final adjustments you’ll have enough time. 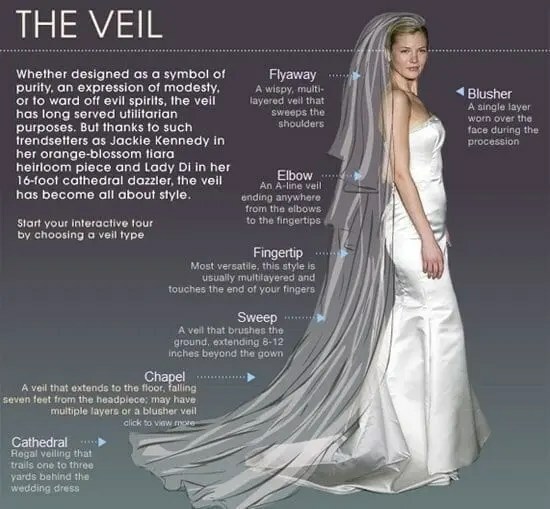 There are many different types of details you can add to your veil. Cut/raw edge… This hem is the most basic and has no details. However that doesn’t mean you can’t add your details somewhere else on your veil. Rolled hem… This type of hem is commonly done with a satin trim. However you can also have a rolled hem with using the tulle itself. Beaded hem… A straight or designed beaded pattern on the hem of your veil. This can also incorporate crystals and some extra bling. Lace hem… A lace hem has many options based on the type of lace you want to use. There’s a wide array of different kinds of lace out there. Some are more detailed than others and can be decked out with beaded details. Then there are some that are simple yet beautiful. It’s best to discuss your options before purchasing a veil with this type of hem. Scalloped hem… This type of hem is not straight but shaped. This can be done without any additional details or the scalloped edge could have a lace or a beading design to add to the shaped hem. Birdcage veils are usually plain and either use diamond netting or a cut/raw tulle edge. Again, that was a very small list. The possibilities depend on your personal taste. The best part of doing custom accessories is that it brings that special something into your look. Whether it’s hand beading a design to match your dress or incorporating a part of your mothers wedding dress, having a custom veil just adds that one-of-a-kind detail that makes your wedding more memorable. Email me at designs@alysonnicole.com to start your extraordinary bridal veil and accessories.